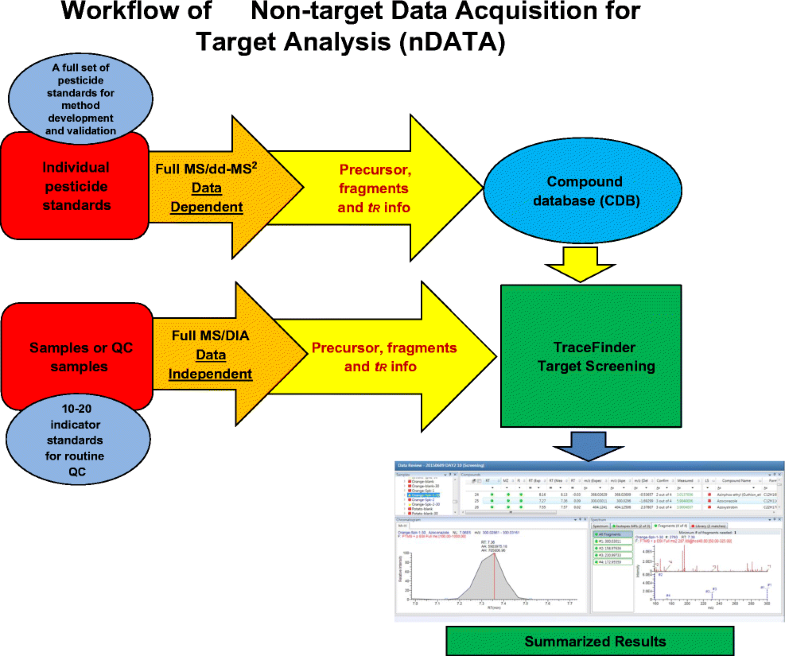 A non-target data acquisition for target analysis (nDATA) workflow based on accurate mass measurements using UHPLC/ESI Q-Orbitrap full MS-data-independent acquisition and a compound database was developed to screen pesticide residues in fruit and vegetable samples. The compound database of 845 pesticides was built from dd-MS2 (data-dependent acquisition) product ion spectral data and LC retention times of individual pesticide standards. MS2 spectra of samples were acquired using multiplexing data-independent acquisition (mDIA) and variable data-independent acquisition (vDIA). 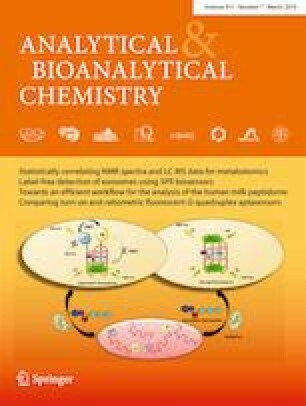 Screening of pesticides in samples was based on either the retention time (± 0.5 min) and the mass accuracy (± 5 ppm) of a precursor (RTP by full MS) or the retention time (± 0.5 min) and the mass accuracy (± 5 ppm) of a precursor and its fragment ion (RTFI by full MS/DIA). In validation studies involving mDIA and vDIA analysis of 10 fruits and vegetables spiked with pesticides prior to QuEChERS sample preparation, RTP correctly found up to 765 and 796 pesticides at 10 and 100 μg/kg, respectively, whereas RTFI correctly identified up to 729 and 764 pesticides at the same respective concentrations. UHPLC/ESI Q-Orbitrap full MS/mDIA or vDIA proved to be a comprehensive detection technique and has potential for pesticide residue screening in fruits and vegetables. The online version of this article ( https://doi.org/10.1007/s00216-019-01581-z) contains supplementary material, which is available to authorized users. The authors would like to acknowledge the United States Environmental Protection Agency National Pesticide Standard Repository for providing some of the pesticide standards required to build the pesticide compound database. The work was a result of a collaborative research agreement between the Canadian Food Inspection Agency and the United States Food and Drug Administration. Health Canada. Maximum residue limits for pesticides. http://pr-rp.hc-sc.gc.ca/mrl-lrm/index-eng.php. Accessed 14 Jan 2019. US Environmental Portection Agency. Regulation of Pesticide Residues on Food. Maximum residue limits for pesticides. https://www.epa.gov/pesticide-tolerances. Accessed 14 Jan 2019. European Union. EU - Pesticides database. http://ec.europa.eu/food/plant/pesticides/eu-pesticides-database/public/?event=homepage&language=EN. Accessed 14 Jan 2019. Codex Pesticides Residues in Food Online Database. Maximum residue limits. http://www.fao.org/fao-who-codexalimentarius/codex-texts/dbs/pestres/en/. Accessed 14 Jan 2019.